A few years ago, I was standing in line at a McDonald's in Oklahoma when the guy behind me started a brief conversation. Noting my Green Bay Packers cap, he said, "A Packers fan, huh?" Being English, I am not used to complete strangers suddenly addressing me and I was caught by surprise - all I could think of in reply was "Yup." But, wanting to continue the conversation, I added after a moment's thought, "And what team do you support?" The guy was a master of delivery and timing. With a deadpan face, he answered instantly, "Whichever team is playing the Cowboys." Now that is a sentiment I can recognize in myself. In soccer, for instance, I support any team that plays Manchester United since, for some reason that I don't understand, I detest that team. And I admit that any driver who spends most of his career at Ferrari has a mountain to climb if he wants to win my support. Even Kimi is slightly suspect - I'm glad he is champion this year but I'd have been just as pleased if Hamilton had won. And so today, when I read Keith's Collantine's weekly round-up of the blogs and came across a review of Gilles Villeneuve's career, I was reminded of how mixed were my feelings about Gilles during his lifetime. He was, after all, a Ferrari driver through and through. Before the red team took him on, he was regarded as talented but wild and there were a few of those around at the time. It was Ferrari that gave Gilles the circumstances and equipment to make a name for himself. They were not always the best cars but were so different from the Cosworth-powered pack that, given Gilles' ability to squeeze the maximum from an advantage in any area, he could demonstrate his gargantuan will to win. At the time, I was a Nelson Piquet fan - mainly because I loved the way he rubbed Lauda's nose in it when they were team mates at Brabham in 1979. I had a friend who was an ardent Gilles supporter and so, very often, I found myself in the position of having to rubbish the Ferrari driver, in spite of my secret and grudging respect for him. And it is entirely appropriate that Nelson should have been his harshest critic. At this distance, I can look back and say that, yes, Gilles was one of the greatest drivers of all time. But it is still true that there was a wild streak in him that brought a long list of spectacular crashes. All or nothing, that was Gilles. Looking down the list of times at the Barcelona test yesterday, the sore thumb turned out to be quite unexpected: Giancarlo Fisichella with fourth fastest time in last year's Force India. There is life in the old dog yet, it seems. And we are reminded that Fizzy always gives of his best when in adverse circumstances - when the car is useless, he'll make it shine. Yet Giancarlo is no Villeneuve. Too often have we seen him give up a position in the race without a fight. This apparent unwillingness to defend overpowers our impression of his grittiness in uncompetitive cars and leaves us thinking that it may be time for him to retire. It is only his transfer to a backmarker team that raises our interest once again. He is not the only one with the specter of retirement hanging over him - David Coulthard has been expected to call it a day for a few years now but still he soldiers on. And he is another who seems to lack that Villeneuve spark of fierce determination - although he will fight to defend a position, even when outside the points. To be fair, drivers with the Villeneuve factor are pretty rare these days. Kimi springs to mind immediately, of course, but who else is there? Too many of them are in the Prost mold, cold calculators of the best chance, totting up the points for the championship and sulking if anyone bangs wheels with them. Except maybe Hamilton. He took his disappointments in the final races with Kimi-like cool and his mistakes were the result of trying to win the race, rather than thinking of the championship - so reminiscent of both Kimi and Gilles. It is too early to tell but it may be that the wonder boy is one of the real racers, the death or glory merchants that we come to love so passionately. Far from criticizing him for throwing away a championship, perhaps we should be praising his need to race above everything else. It would be especially nice for me if Hamilton were to turn out to be "The One". With the only recognized racer now driving for Ferrari, I am torn in my sympathies and desperately need a contender to appear in another team. Let Lewis continue to show that determination to win regardless of common sense and I'll be only too pleased to support him against "that Ferrari driver." Your introduction is VERY appropriate for this Super Bowl weekend. Very nice entry, by the way! Thank you, Journeyer - it was really just a rambling series of thoughts after reading about Gilles that I tied together this morning. A lucky accident that it happens to be Super Bowl weekend too! Agreed that it looks as though Kimi and Lewis will be the main contenders in the coming season. As wild cards, however, how about Kovalainen and Heidfeld? I was never a Ferrari fan and like yourself group them with the modern Man Utd. However I am and always was a Gilles fan. I love the fact that he never gave up regardless how bad the cars he drove were. It is hard for fans of modern F1 to understand just how bad some of those cars were. Enzo Ferrari would never tolerate any of his drivers criticising his cars but smiled when Gilles called one of them a sh1tbox. Gilles said that he wasn't complaining as it was his job to race it but he was asked his opinion and his opinion was that it was sh1tbox. People have a view of Villeneuve as a rock ape who didn't understand how he got the results he got and that he just had an unnatural talent for driving. Nothing could be further from the truth. He was immensely clued up mechanically. When he was racing snowmobiles he designed and built a revolutionary new suspension system. Every factory team copied his design. In some ways he was the first of the modern drivers. Most drivers didn't think about the team or car when they were at home. In the days before the internet and fax machines the only thing available was telex which effectively was a typewriter which could phone another typewriter. You type at one end and it prints out at the other. 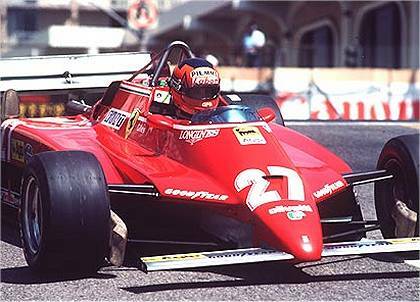 Gilles had a telex installed in his home in Monaco and used to send humungously long telex messages to Ferrari's secretary every day discussing how the car could be improved and keeping in touch with work at the factory. Keke Rosberg has enormous respect for Gilles. You get the impression Gilles was his hero. The driver Keke wanted to be. Until last year I had never heard him compare another driver to Gilles and never thought I would hear him say anyone was as brave as Gilles. In an interview about Lewis Hamilton before the start of last season he raved about him and compared him to Gilles. He also sadi he was extraordinarily brave, Gilles brave. I sat and stared at that sentence for at least 5 minutes because I just couldn't believe Keke had said it. Keke used to run a karting team for Nico and Lewis was his team mate so he has had a real close look at him, seen the data and compared him to Nico who is himself a very good driver. For me the only current driver who will be compared with Gilles is Lewis. I said after three races last season that I believe he will be the best driver of his generation and I believe in time he will be a contender for the greatest ever title. Gilles's Jarama win shows everything that is wrong with current F1. That drive has gone down in legend because he won with a chassis that was garbage. Ferrari was only interested in engines and the engine was a cracker but the chassis was years out of date and not a very good version of outdated technology. Today he would have been 5th after the first stop, 10th or 12th by the second stop and utterly forgotten long before the end of the race. If Keke says it, it's good enough for me, Steven. He was another driver who won his races in sh1tboxes and who competed for sheer love of the sport - plus, he called a spade a spade and had no illusions about his own abilities. He is probably the reason why Nico is so level-headed as well as being one of the quickest of the newcomers to F1. And that means that Hamilton really is the business - as I have suspected for some time now. I'll withhold final judgment for a while yet, just as we did when Gilles first appeared, but the signs are there. It's a great time to be watching F1 and I can only hope that Max's constant tinkering with the rules doesn't ruin it before we have seen just how good Lewis is. Can't believe I never thought of him. He could cut through the garbage and sort out the nonsense around racing. Hmmm, that's a thought. He probably has too much sense to take the job, however. A quick Keke story that sums up his calmness and quick humour. Nigel Roebuck many years ago, not long after Keke had retired as a driver wrote that he had gone out to a particular corner of a circit with Keke to watch a practise session. Having press passes they were able to get into areas that the rest of us can't so they were standing just behind an armco barrier. They too their eyes off the action to light their cigarettes and while their heads were down a car left the track and embedded its nose under the barrier just in front of them. Keke turned to Roebuck and said 'It's just like Frank is always telling me. Smoking is bad for your health'. I love that anecdote, Steven - great bit of comic timing! I feel a bit the same way about Schumi. I couldn't stand him in the past (dating from the incident with Coulthard at Spa 1998) and detest that team he drove for. But I have a grudging respect for his talent, and it seems like off track he is not such a bad bloke. I remember seeing an interview with him after a crash in practice on year where he was asked if the crash was caused by a mechanical issue. His reply was "Yes, I think it was a problem with the nut between the seat and the steering wheel!" And I still feel so strongly about Schumacher that I cannot bring myself to call him by the sobriquet you used, Peril. To me, he is Mickey the Shoe. I hear stories such as the one you relate and still I will not forgive him the damage he did to the sport. My attitude is probably unreasonable, blinkered and unfair but, as we poms say, he gets up my nose! Sure, I can recognise that he was a talented driver, one of the best of his era. But this just makes it worse that he chose to cheat so often. Winning is not everything. Oh, you'll find no arguement there with me, Clive ! Aarrgghh, a typo! Sorry, Keith, some sort of major brain fade there - I've re-read that post a hundred times and missed that one completely. Fixed now!